I like shows. I like to visit with like minded folks and I like to see the latest, greatest toys. Lately, at least for the past four years, the tone at some of these shows seems to have ranged anywhere between desperation and bliss. There is one constant- the show is busy and there is rarely enough time to get quality time. Funny thing is, as good as the speaker content is this year, the off-line conversations can be even more interesting. So, in that vein, I want to see and talk with as many folks as I can. If you are interested in meeting with me and talking about anything from self-replicating nano-bots, MpS compensation plans, M2M communications, the Cloud and its impact on business process, or who has the best MpS infrastructure program, let's schedule something. I will be in Orlando from Monday evening to Saturday. 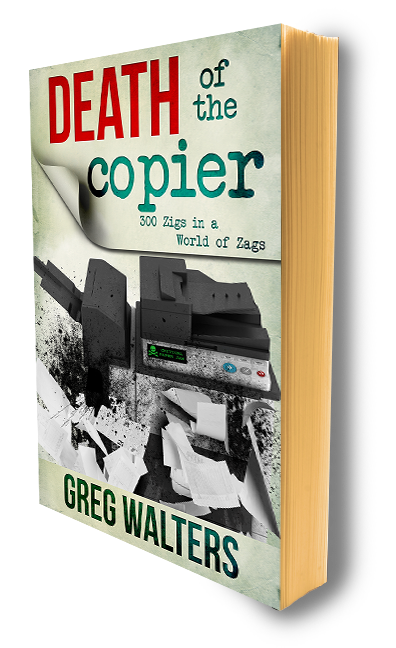 I have a presentation and some hard meetings set up, but send me an invite at greg@thedeathofthecopier.com and maybe we can get together for a few minutes. Wide open, no charge, possibly over an adult beverage.